Retired Marine General James Mattis, picked by President-elect Donald Trump to take over the Department of Defense, testified before the Senate Armed Services Committee, defending NATO, the F-35, and continued confrontation with Russia. His appointment as secretary of defense requires a waiver from both the House and the Senate, due to a federal law that service members must wait seven years after retiring from active duty before they can hold senior civilian defense positions. The committee voted in support of the waiver, with 24 votes in favor and 3 opposed. In the Senate, the waiver bill easily received more than the 60 votes required to pass on Thursday afternoon. The final tally was 81 in favor an 17 opposed, with Hillary Clinton’s running mate Tim Kaine (D-Virginia), reportedly casting the 60th "yes" vote. 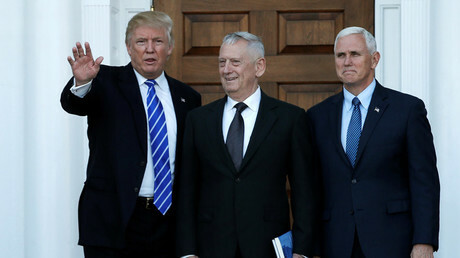 Mattis was introduced by former Senators Sam Nunn (D-Georgia) and William Cohen (D-Maine), who also served as Defense Secretary under Bill Clinton. The general’s nickname of ‘Mad Dog’ a “misnomer,” Cohen said. “It should be Braveheart,” he said, adding that Mattis is not only a courageous warrior but a scholar of military history, with an extensive collection of books. “Our Armed Forces must remain the best led, best equipped, and most ready force in the world,” Mattis told the lawmakers. “My watchwords will be solvency and security in providing for the protection of our people and the survival of our freedoms,” Mattis said. The US should not be turning to military power as the answer to all of its concerns around the world, the retired Marine general added. Chairman of the committee, Senator John McCain (R-Arizona), questioned Mattis on his opinion of how much threat Russia represents. The world order is “under biggest attacks since WW2, from Russia, terrorist groups, and China’s actions in the South China Sea,” Mattis told McCain, agreeing with the bellicose senator that Russia is trying to break up NATO. “That nickname was given to me by the press,” Mattis said, adding his approach would be “Peace through strength” established by the first US president, George Washington – and often invoked by Trump. Asked by Heinrich to list the principal threats to the US, Mattis said he “would start with Russia,” and continue with aggressive states and terrorist groups. Senator Elizabeth Warren (D-Massachusetts) reminded Mattis that he once said Russia was “trying to create a sphere of unstable states along its periphery,” and pushed him to argue this with the president. She later voted against the waiver. “I think America has global responsibilities, and it’s not to our advantage to leave any of those areas of the world,” Mattis told Senator Dan Sullivan (R-Alaska), who raised the alarm about the increased Russian presence in the Arctic. Nelson pressed Mattis on the possibility Trump would want to abolish NATO. “Senator, if we did not have NATO today, we would have to create it. NATO is vital to our national interest and the security of the US,” Mattis said. The questions from Senators often returned to the issue of the budget sequester, due to the legislation introduced by President Barack Obama in 2011. “I don’t have a solution for… the self-inflicted wound of the Budget Control Act,” Mattis told Sen. Claire McCaskill (D-Missouri), but promised he would spend the Pentagon’s budget on what it should be spent on. “If I can’t make an argument to you for why we need a military program, I am willing to lose it,” Mattis told Senator Mike Rounds (R-South Dakota), explaining that the sequester takes away that decision from the Congress and mandates cuts across the board instead. Mattis also defended the construction of F-35 fighter jet that Trump criticized as expensive and ineffective. “Many of our allies have bet their air superiority on the F-35 program,” Mattis acknowledged to Senator Richard Blumenthal (D-Connecticut). “[Trump] has in no way shown a lack of support for the program, he just wants more bang for the buck,” Mattis told Senator Ted Cruz (R-Texas). Trump’s tweets about military acquisitions “show he’s serious” about getting the best value for the defense dollars spent, Mattis said, disagreeing with Sen. Mazie Hirono (D-Hawaii) that such actions were inappropriate. He also backed the president-elect’s position about US allies needing to contribute their fair share of military spending. Senator Joni Ernst (R-Iowa) brought up her prior military service to criticize “outdated small arms and ammunition,” singling out the M9 pistol and the M-16 assault rifle. She was seconded by Senator Thom Tillis (R-North Carolina), who brandished as a prop the 680-page request for proposals for a new handgun, bound in red tape. Senator Angus King (I-Maine) asked about the challenge of making the Pentagon more efficient. “What we don’t want to do is have layer upon layer of bureaucracy that’s not value added,” Mattis said, adding that he will need congressional support to abolish some of the waste. 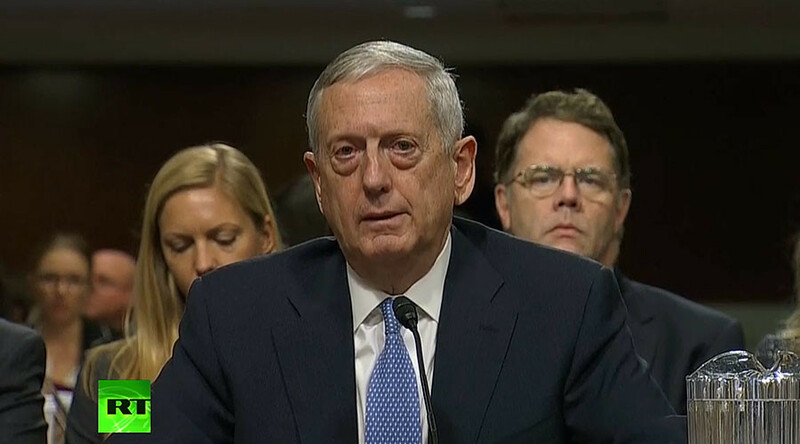 Modernization of command and control needs to be a priority in updating the US nuclear deterrent, in light of the cyber challenges the US is facing, Mattis said. Increasing the maintenance budget and asking for allies to pull more weight were some of the ways Mattis envisioned bridging the gap between readiness and solvency, an issue brought up by Senator Cruz. Mattis also expressed his support to Israel. “Israel is a fellow democracy and I think Israel’s security is very important to the US,” Mattis told Sen. Roger Wicker (R-Mississippi). “Are there any other democracies in the Middle East?” Wicker asked. Senator Jeanne Shaheen (D-New Hampshire) asked about the US troops in Poland in the context of US “reassuring” NATO allies. “NATO is the most successful military alliance probably in modern world history, maybe ever,” Mattis said, but mistakenly argued that “the first time NATO went into combat” was after the 9/11 terrorist attacks. The alliance actually went to war in 1999, against Yugoslavia. Senator Kirsten Gillibrand (D-New York) grilled Mattis about his previous comments on having women and homosexuals in the military. Mattis brushed off further inquiries on the subject by stating, "Frankly, I've never cared much about two consenting adults and who they go to bed with." Mattis retired from the US Marine Corps in 2013 after serving as the 11th commander of US Central Command, replacing General David Petraeus as the overseer of US operations in the Middle East and Afghanistan. Before that, he commanded NATO forces in Europe. In addition to the Senate hearing, Mattis was supposed to appear before the House Armed Services Committee (HASC) later on Thursday, but that appearance was canceled by the transition team, according to Military Times. The HASC passed the waiver in a 34-28 vote along party lines. The waiver now goes to the House, where a vote is scheduled for Friday.